Due to a lack of committed participants, we regret to inform everyone that Camp has been cancelled. Despite this, we will still be holding an investiture on the 9th of September at 11 AM. It will be taking place at St. Peter's Mission Church, 6056 Ninth Line, Mississauga ON L5N 0C1. Please email the State Squires Director with the number of Squires you intend on bringing. Please continue to pass this information on to the members of your Circle. The Provincial Board will be hosting a Squires Camp in Lambton, Ontario from the 8th - 10th September 2017. The flyer below has all the details. Please spread the word around so that all members of your Circle know about this opportunity. Squires, you can also bring along friends who are thinking of joining your Circle and we look forward to your active participation for this fun-filled weekend! The Installation of the newly elected Provincial Board will be held at the Camp. We will be having an Investiture as well. For those that are planning to start or reactivate their Circles this is a great opportunity. Please book early. Welcome to the new site which went live as of July 5, 2017! 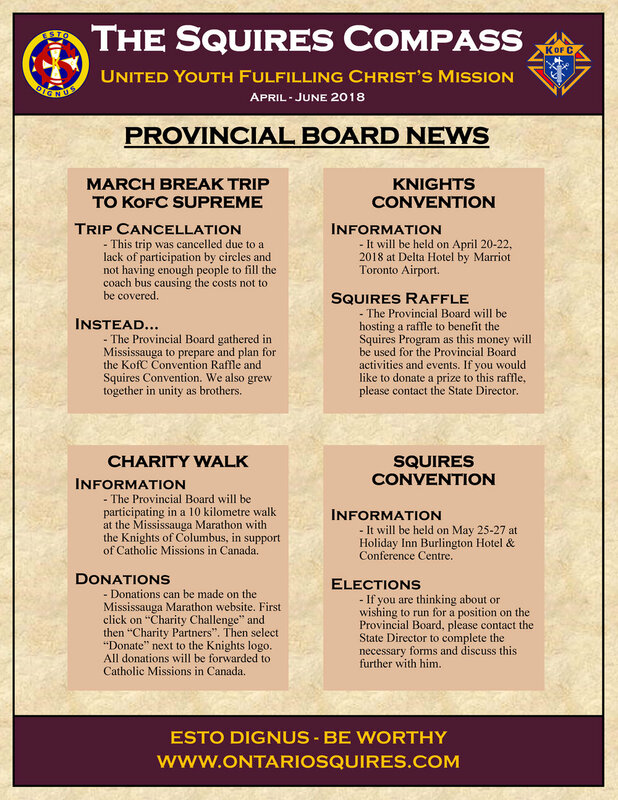 This is the first step in an effort to revamp and promote a successful year for the Columbian Squires of Ontario. We're going to keep this site as active as possible so please keep us bookmarked. Navigate around and provide us your feedback in the About -> Contact page, located in our About section. Some links and documents may still be a work in progress, but not for long! Suggestions, photos, and comments are appreciated. We thank you for your co-operation as we work to better our online presence! P.S. It would be pretty cool to have your circle's photo up first in the For Squires -> Circles page, so be sure to send them in quick! Please make sure your photo is of equal width and height!